Ads on Kindle Fire HD tablets: Bad news or just business? Updated. 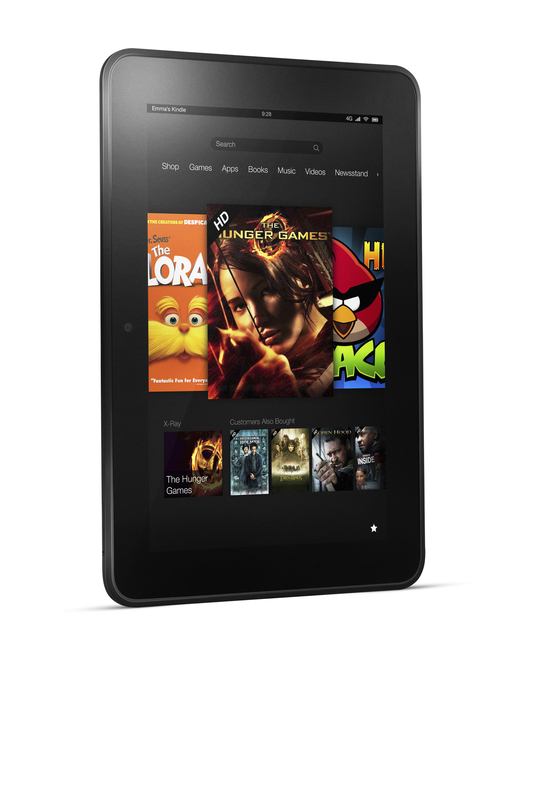 Amazon impressed with its new Kindle Fire HD tablets this week, offering what it calls “high end” devices at low prices. Case in point: The 8.9-inch Kindle Fire HD(s amzn) has 1920 x 1200 display, dual-antenna Wi-Fi, Dolby audio sound and fast dual-core processor. Twenty minutes before the pricing details, I correctly guessed that Amazon would be aggressive with a $299 price point for the device. There’s a catch in the price, however, and it’s causing quite a debate. All of the new Amazon Fire HD tablets include “special offers” which are essentially advertisements for Amazon goods and services. This isn’t new. Kindle readers with special offers have been available since May of 2011: Instead of paying full price, a customer gets a discount on the device, which has ads. In my opinion — as the owner of a Kindle Touch with special offers — these are unobtrusive as they appear on the Kindle lock screen and at the bottom of the menu screen. I’ve never seen an ad in my content. Others disagree and don’t want ads on their Kindles at all, so they pay extra. To each, his or her own. But here’s part of the ire I’m hearing about the new Kindle Fire HD tablets: Amazon isn’t offering a buy-out price to remove the special offers. Instead — at least for now — ads will appear on the lockscreens and home screens of the tablets. I hope Amazon reconsiders and offers the option of removing the ads. Regardless, the situation is an example of how the digital economy is changing and challenging traditional business models. We’ve seen a similar approach with phones in the U.S. for years: Carriers subsidize the hardware in return for a lock-in of service. These carriers also add their own software and services — often not removable –on the phones. And consumers are totally reliant upon carriers to get software updates as well. In other words: You don’t have control over your phone and the subsidy is financial in nature. People complaining about buying an ad-subsidized #Kindle Fire should never buy a smartphone with contract from a carrier again. Subsidies don’t always mean money, however. Information is currency in the digital age and that’s exactly what Amazon is using to subsidize the Kindle Fire HD hardware costs in order to make the price more attractive. I noted this potential change back in 2010 when I suggested that Google subsidize smartphones or mobile broadband service in return for similar information and ads. It’s a shame that Amazon isn’t giving consumers a choice to remove the special offers with a small buyout. But as a consumer, you do retain some choice. If you feel the ads will be intrusive, you can choose to buy a different tablet. Again, I hope Amazon reconsiders; perhaps after it gets a feel for sales as compared to the unit costs to build the devices it will do so. For now though, you take the good with the bad if you want a new Kindle Fire HD. And I doubt this is the last product we see use an information subsidy or ad-supported hardware approach. The Internet has changed the world and business models are changing with it. Translation of this blog post: I was right. Go me. I was right. Aren’t I amazing? What’s next, ads in newspapers? Magazines? Lining our highways? Movies? Geesh, personally I hate ads but if people want a kindle f I doubt ads will be a problem. I’m not convinced that this scenario will send the message to Amazon that people don’t want ads. If sales of the Kindle Fire HD are below Amazon’s expectations, how will Amazon know the ads are the cause of it? Maybe people prefer Apple, to name one possible reason, or maybe they didn’t like the original Kindle Fire. the issue with removable ads is that it’s the people who are will t pay a bit extra who the advertisers are targeting in the first place. for an app or a device with free and paid versions advertisers are for the most part only interested in the paid users and are willing to pay much if anything advertising to the ‘freeloaders’ on the ad supported version. dual versions(of apps or devices) with ad support for the free or cheaper one will never work since the advertisers are after the bigger spenders. That’s not really true. There are lots of people who could afford to buy the device without ads, but just aren’t bothered by them, or even WANT them, and so don’t really care. If you go read the discussion forums at Amazon for the Kindle you’ll see lots of people not bothered by this because they actually LIKE the ads, and have clicked-through on more than one of them, especially the Amazon-related ones. I make plenty of money, and even if they made an ad-free version for say $30 or $50 more, I wouldn’t bother because it doesn’t seem worth the money to me. It doesn’t mean I don’t *have* the money, just that I choose not to spend it on that, and may very well click-through Amazon ads more than others because Amazon knows me so well given all my past purchases with them. what i am saying is not that there is no market for ads on the cheaper units, but that the ‘upspenders’ who buy the ad free version are probably people who ‘buy up’ on most purchases and the very top pick of people the advertisers want to target. so amazon loses the top socio-demographic groups that could help sell large amounts of ads at higher prices when they let people opt out. i also would not pay any extra for an ad free version even though i could easily afford it. but i make it a point to mentally block out ads, so i am a rotten deal for the advertisers. Cheap people will buy Kindles ads and all. if cheap people are the buyers th advertisers will soon move on. thats why no two versions with and without ads. Unremovable ads on the tablet make it portable TV set. User becomes product of the tablet maker, which is sold to advertisers. This is evil. The dark side. And I hope, I will never see iPad with such an approach. For Amazon offering lower price for Kindle Fire HD is the matter of grabbing subscriber base. So as for Google is offering Android for free to HW manufacturers. This is why they are still able to compete with Apple. Finally, this is user’s choice, but personally I do not want any ads on my mobile device. from a business stanpoind this could prove to be super success in markets like India & rest of the South east asia where experience holds second position compared to price since these markets are hugely dominated by middle class who want to put their hands on the latest gadgets and have no issues with ads since their lives are already surrounded by all forms of advertising.